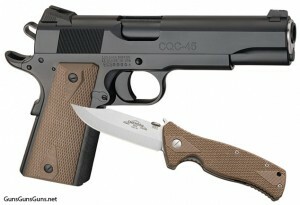 Summary: The description, specs, photo, pricing and user ratings for the Les Baer Baer/Emerson CQC-45 pistol and knife set. Ernest Emerson’s signature Ace of Spades playing card with a bullet hole shot through the center of the card and the card signed by both Les Baer Sr. and Ernest Emerson. This entry was posted in .45 ACP, $3,001-$3,500, 1911, Full size, Les Baer, Semiauto on May 9, 2011 by Staff.